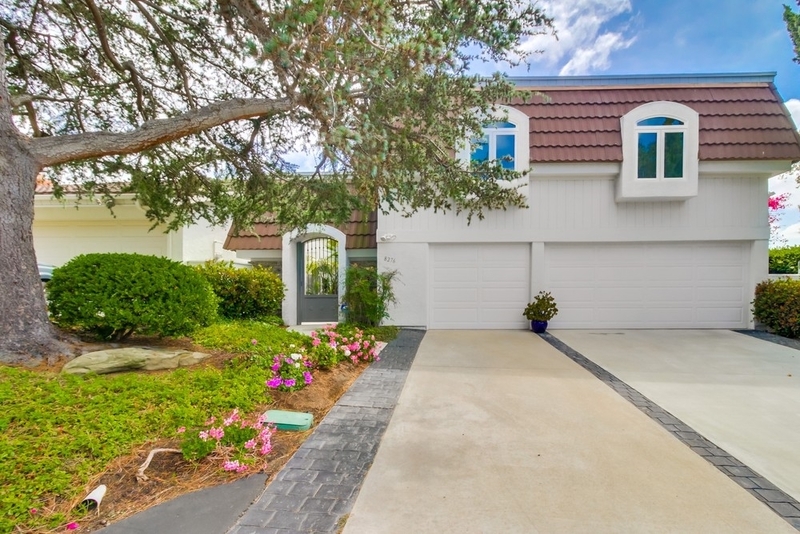 This elegant light, bright condo with soaring ceilings, is on a small cul de sac in La Jolla Woods I. The floorplan is extremely comfortable with well sized eat in kitchen and separate family room. All of the bedrooms are spacious with 2 of them currently set up as his and her offices. The Master is particularly large with its own sitting area. The windows have all been replaced except one slider and the large stationary windows, plus those in the master are now triple glazed. See supplement....., This home has many newer items including the beautiful hardwood flooring throughout the main level The refrigerator, microwave and washer/dryer have all been recently replaced, as has the HVAC unit.The front gate is new and the solid mahogany front door was recently refinished. The pleasing and private back yard is larger than in many of the homes in the complex with ample room for the separate seating areas. It also has a feeling of being extended by the green belt running behind. There are several fruit trees and a nice side yard compliments the indoor spaces with light and plantings. Ask agent about other items included in HOA Fee. The location of this complex is so convenient to all the shopping and restaurants of UTC, and the town of La Jolla, as well as the UCSD campus and all its related activities. There are also several religious institutions close by as well as the "Y" This is a great place to call home.